Home | Blog | Nutrition | Can You Cook Eggs in the Microwave? Is Cooking Eggs in the Microwave Safe? Imagine waking up with a grumbling tummy and only a few moments to spare before you have to rush out the door. Nothing would be better than the sound of butter hitting a hot pan and frying up some eggs to start the day, but you simply don’t have the time. You consider popping a few in the microwave for a quick breakfast, but you wonder — are microwaved eggs safe? Microwaves are convenient kitchen tools when you’re in a hurry or not in the mood to cook. Ninety-six percent of American households own a microwave, and it’s hard to imagine life without these handy appliances. You might be hesitant to cook eggs in the microwave during the early morning rush for various reasons. Perhaps you’re worried it’s an unsafe cooking method, or you aren’t sure how to cook eggs in the microwave. In this post, we’ll explore everything you need to consider when it comes to microwaving eggs, and we’ll share some cooking tips. That way, next time you’re hungry and on the run, you’ll know exactly what to do. Before we get started, let’s consider how microwaves cook food. A lot of people hold negative views about microwaves, but the truth might surprise you. Microwaves can be one of the healthiest ways to cook food. Microwaves cook food using energy waves. These waves are similar to radio waves but shorter. The energy waves mostly target the water molecules in food and cause them to vibrate and build up heat. Unlike conventional ovens, which slowly cook food from the outside in, microwaves cook food more evenly at once. Some people associate microwaves with harmful radiation. However, the type of radiation associated with cancer is ionizing radiation. The radiation from microwaves is non-ionizing radiation and cannot chemically change the cells or DNA in the food we eat. The American Cancer Society agrees that microwaves do not make food radioactive. Eggs already offer many benefits to consumers. First, they are extremely affordable. On average, a dozen eggs cost around $1.73 in the United States. Compare that to other favorite breakfast items such as sliced bacon, which costs an average of $5.42 per pound. Retain more nutrients: Anytime you cook eggs, you lose some of the nutrients whether you microwave, fry or bake your eggs. However, according to Harvard Medical School, the best cooking method for nutrient retention involves heating food for the shortest amount of time and using as little liquid as possible. Microwaves do just that. No supervision required: Often, you can pop food in the microwave, set the time and walk away to do other things until your food is ready. When you cook at the stove, especially if you’re frying eggs, it’s not always best to walk away. If you do, you might return to over-crispies instead of over-easies. Save energy: Microwaves consume less energy than conventional ovens for a couple of reasons. First, a microwave operates at about 600 to 1,650 watts, while an oven uses about 3,000 watts. Second, microwaves direct about 60 percent of their energy towards food, while ovens direct only about 12 to 14 percent of their energy towards food. Save time: When you use a more traditional method to cook eggs, you usually need to take a handful of steps to reach the final product. You might have to preheat the oven, wait for the water to boil or wait for the pan to get hot. Any of these could take several minutes. Then you must cook the eggs, which could take a few minutes or more, depending on the recipe. Finally, you must clean the dishes and utensils used throughout the process. When you microwave eggs, you basically crack them open into a microwave-safe dish and put the dish in the microwave for a minute, give or take. Risk of overcooking: Cooking eggs too long or at too much power in the microwave can overcook them and lead to a nutrient loss. Make sure you follow recipes precisely and don’t overdo it to keep eggs optimally nutritious. When you use the stove to cook eggs and constantly keep an eye on them, you’re more aware of how much time they still need. Dehydration: Microwaves use the food’s water molecules to cook the food. Foods with high water contents tend to cook better in the microwave, while foods like eggs and meats could get tough from microwave cooking if cooked on too-high settings. No browning: If you love your eggs served brown and crispy around the edges, you’ll have better luck sticking to the stovetop. Microwaves can’t brown food, which might not be the presentation you want. 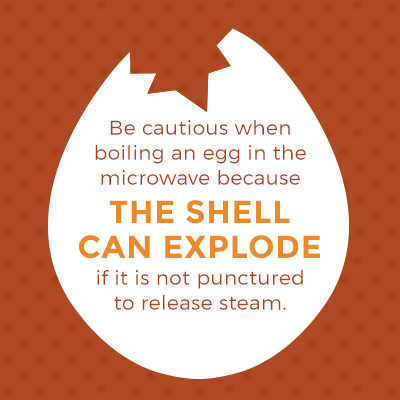 Shell could explode: You must be cautious when boiling an egg in the microwave because the shell can explode if it is not punctured to release steam. It’s best to avoid this risk altogether and remove the shell before microwaving an egg. The microwave heats the egg so quickly that pressure builds up and eventually bursts through the shell. It’s also recommended to pierce the yoke in an unbeaten egg for the same reason. Yes, it is safe to cook eggs in the microwave, whether you wish to poach, scramble, or “fry” your eggs. Sometimes, microwaved eggs taste even better than stovetop eggs. For example, you can make perfectly poached eggs in the microwave without needing to form a whirlpool. More on that in a bit. Always use microwave-safe containers: This rule applies to anything you cook or reheat in the microwave. Safe containers include glass, ceramic and paper plates that do not contain any plastics. Do not put aluminum foil, metal containers or certain plastic containers in the microwave. Do not cook eggs in an un-pierced shell: You can make a hard-boiled egg in the microwave if you pierce the bottom of the shell first. However, as mentioned above, you might want to play it safe and boil your eggs on the stovetop instead to avoid an eggsplosion. It’s also a good idea to pierce the yolk and white a few times or whisk the egg completely to help prevent splattering. Do not superheat: Superheated means that a liquid had been heated beyond its boiling point without signs of boiling. If a liquid is superheated, any movement could cause it to erupt out of its container. You want to avoid overheating any liquid in the microwave to steer clear of burns. Microwaved eggs are just as healthy, if not more so than oven-cooked eggs. 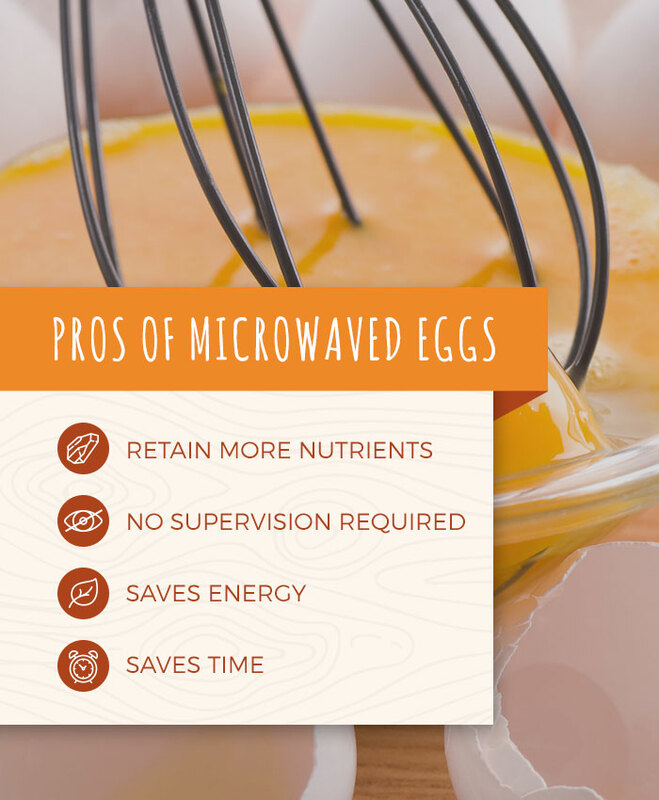 Depending on how long you cook them and what you cook them with, you can maximize an egg’s nutrition using a microwave. Certified food scientist Guy Crosby, Ph.D., says you can lose anywhere from 80 to 90 percent of nutrients when you roast, bake or fry food because nutrients can’t withstand dry heat. However, microwaves cook food faster, exposing nutrients to heat for less time. Nutrients like B1, B2, B6, vitamin C, and folic acid tend to fare better in the microwave. Nevertheless, heat is destructive. Sometimes, this is a good thing. For example, heat kills harmful bacteria, like salmonella. When it comes to eggs, it’s also beneficial to cook the egg whites until they’ve solidified. Egg whites contain 57 percent of an egg’s protein. Heat helps our bodies process the protein in egg whites. 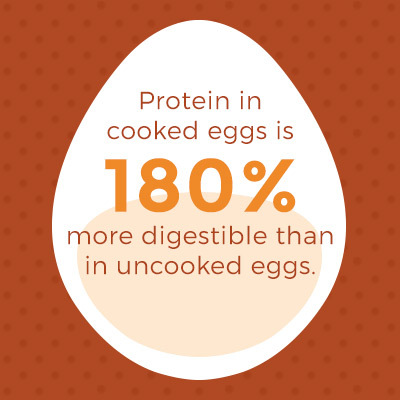 Protein in cooked eggs is 180 percent more digestible than in uncooked eggs. With that said, the bulk of nutrients exist in an egg’s yolk. To retain the most nutrients in eggs, you should avoid overcooking the yolks. For example, one study found that eggs only retained 39 to 45 percent of vitamin D when baked in the oven for 40 minutes at a normal cooking temperature, while frying resulted in 82 to 84 percent vitamin D retention. Also, overheating the yoke oxidizes the fat in the yolks, which can make them sticky and hard for the body to use. Therefore, the healthiest ways to cook eggs in the microwave is to poach the eggs. Poached eggs are cooked just long enough to make the proteins more bioavailable, but not so long that they lose vital nutrients. Also, microwaved poached eggs do not require the use of fats like butter or oil. The key to an optimally healthy egg is to cook the whites and preserve the yoke as much as possible. Like your eggs scrambled? You can boost the nutrition in microwaved scrambled eggs by mixing in veggies like spinach, bell peppers or broccoli. Overall, no matter what method you choose to cook your eggs, you’ll still get a healthy dose of nutrition. Beat the eggs: Egg yolks usually cook faster than the whites because they contain more fat. For this reason, scrambled eggs, omelets, and other recipes that call for beaten eggs tend to cook more evenly in the microwave than other preparations. Consider egg size: A jumbo egg will need more time in the microwave than a large egg, so you might need to adjust cooking times accordingly. Use minimum times: To prevent overcooking, start with the shortest time and add time in 10 or 15-second increments until done. You might have to cook items longer than what recipes call for if your microwave has a lower wattage. Also, keep in mind that eggs will continue to cook and get firm after you remove them from the microwave. Try to cook evenly: To promote even cooking, stir the eggs with the ingredients if possible, cover microwave-safe containers and rotate the container during cooking if the microwave does not have a turntable. Ready to look at a few recipes to see how fun and easy microwaving eggs can be? Some of these are even cooked in a mug — talk about easy cleanup. Crack an egg into a microwave-safe bowl or mug. Add 1/3 cup water and 1/2 teaspoon vinegar. Cook on 50 percent power for one minute. Continuing cook in 15-second increments until the yolk is set. Within record time, you’ll have a perfectly poached egg to enjoy with toast, tasty toppings or on the go. Butter the inside of a mug. Whisk together 1 egg, 1 tablespoon of milk and a pinch of salt and pepper. Cook on high power for 40 seconds. Stir to break the egg into smaller pieces. Stir in a generous pinch of shredded cheese. Top the eggs with bacon crumbles, chopped chives or a spoonful of your favorite salsa and enjoy. Spray a microwave-safe plate with cooking spray or lightly coat with butter. Crack an egg onto the plate. Gently prick the yolk with the tip of a knife. Garnish your eggs with fresh herbs or a pinch of feta and savor each bite. Lightly coat a canning jar with cooking spray. Add two eggs and tasty ingredients such as shredded cheese, chopped ham and veggies. Cover with a lid and chill overnight. When you’re ready for your omelet, shake the jar contents until they’re mixed. Remove the lid and cover the top with a paper towel. Microwave on high for about 2 minutes or until the eggs are fully cooked. Enjoy your microwaved omelet immediately. If you often have a packed schedule, you might find yourself eating on the way out the door or as you inch through the morning commute from time to time. An easy-to-grip breakfast sandwich may be the solution you need. However, a deliciously runny yolk doesn’t always complement your best work clothes, so we’ll share a recipe that offers drip-free options without sacrificing flavor. Lightly coat the inside of a flat-bottomed bowl or cup with cooking spray, butter or oil. Add 2 large eggs, salt and pepper to taste and 1 tablespoon of water. Stir gently to help the eggs cook evenly. Microwave for another 30 seconds or until the eggs puff up. Add 2 tablespoons of shredded cheese. Cook until the egg mixture is set and the cheese is melted, for about another 15 or 30 seconds. Use a small spatula to carefully transfer the cooked eggs to a piece of toast or English muffin. Top with sliced avocado or a few drizzles of hot sauce, cover with another piece of toast and get going with your delicious, nutritious breakfast sandwich in hand. There are plenty of methods for hard-boiling eggs. If you’re in a hurry, try this method. Caution: The inside of the egg can be very hot and be cautious when opening it up or biting into it. Allow the egg to cool down before handling or eating. Eggs are marvelous gifts from Mother Nature no matter how you prepare them. For many families, it’s a relief to know they can safely cook eggs in the microwave and serve up fresh, healthy breakfasts at lightning speed. It’s also fun to explore new recipes and cooking methods, and microwaving eggs is worth trying out. It’s possible that once you discover the magic of microwaving eggs, you’ll get to enjoy more of them in your diet and reap all of their nutritional and economical benefits. Whether you want to microwave eggs for the first time or prefer to keep it traditional, we welcome you and your family at Sauder’s Eggs. Since the 1930s, we’ve been supplying fresh and delicious eggs for customers and their families to enjoy. We take pride in what we do and have been family owned and operated for generations. We believe that eggs are nature’s perfect food, and we hope to share our wholesome eggs with you. To try Sauder’s Eggs for your next egg-based recipe, use our store locator and find the nearest retail location. For more egg-related tips, tricks and interesting info, join our Egg Club or check out our other blog posts.